Ryerson Roofing, Inc. specializes in commercial roofing systems across North Texas. We are headquartered in Grapevine, Texas centrally located to serve all of the Dallas, Fort Worth Metroplex. We are a full-service roofing contractor company handling the largest roofing systems including industrial roofing, warehouse roofing to smaller retail fronts and office buildings. Working directly as a preferred contractor with top manufacturers like IB Roof Systems, GAF, Firestone, Decra, and Karnak gives us the edge and knowledge that we are providing the best roofing supplies, materials, and service in the roofing industry. Ryerson Roofing, Inc works with the top prefered manufactures in North Texas for the best commercial roofing systems possible. Every roofing system is different and knowing the right applications to guarantee a lasting, protected roof is our specialty. Give us a call today for inspection, pricing and roofing options. Extending the life of a roof, a roof coating may be the most effective, economical solution. Acrylic coatings can be installed over single-ply membranes, built-up, modified bitumen, metal, polyurethane foam, concrete, board stock, asphalt and more. The resulting roof is monolithic, 100% adhered to the substrate with no seams, fasteners or adhesives. It will have high reflectivity and emissivity ratings in support of Cool Roof initiatives with resulting energy savings. What’s more, fluid-applied coatings are normally expenses as a first year maintenance cost from your taxes rather than capitalized, which can result in significant tax benefits for your company. This traditional roofing system incorporates the application of multiple layers of insulation boards with the base layer mechanically attached into the substrate with subsequent layers placed in hot asphalt. Multiple plies, alternating fiberglass felts and hot asphalt, are then applied. The system is finalized with either a flood coating hot asphalt, hot asphalt & gravel, or a modified cap sheet. BUR membranes, referred to by the acronym BUR, have been in use in the U.S. for more than 100 years. These roof systems are commonly referred to as “tar and gravel” roofs. BUR systems generally are composed of alternating layers of bitumen and reinforcing fabrics that create a finished membrane. EPDM, Ballasted – The ballasted system presents an easy, economical roofing solution for buildings that can accommodate an average ballast weight of 10 to 12 psf. Because the system is easy to install, it’s ideal of applications where eventual changes in building height or contours are envisioned. EPDM, Mechanically Attached – This system presents a lightweight, cost-effective option if you wish to limit the weight load on the building or to reinforce an existing roof. Insulation, when necessary, is mechanically attached to the deck, with the membrane affixed at set intervals using linear attached batten strips to protect against wind uplift. EPDM, Fully Adhered – This system is especially recommended for applications over an existing substrate where the use of mechanical fasteners is undesirable, or unfeasible. The insulation is installed using hot asphalt, with the membrane fully adhered to the secure insulation. The system may also be installed over insulation that is attached using conventional fastening methods where applicable. It’s also ideal for special configurations such as domes and barrels. TPO, Mechanically Attached Roof – This system presents a lightweight, cost-effective option if you wish to limit the weight load on the building or to reinforce an existing roof. Insulation, when necessary, is mechanically attached to the deck, with the membrane affixed at set intervals using linear attached batten strips to protect against wind uplift. TPO, Fully Adhered Roof – This system is especially recommended for applications over an existing substrate where the use of mechanical fasteners is undesirable, or unfeasible. The insulation is installed using hot asphalt, with the membrane fully adhered to the secure insulation. The system may also be installed over insulation that is attached using conventional fastening methods where applicable. It’s also ideal for special configurations such as domes and barrels. 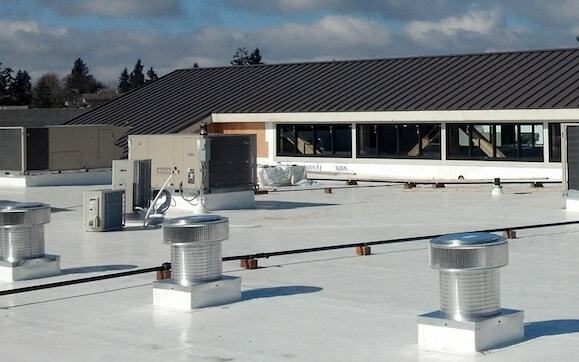 A thermoplastic polyolefin roof (TPO) has become a very popular option, especially among commercial building owners. PVC, Mechanically Attached – This system presents a lightweight, cost-effective option if you wish to limit the weight load on the building or to reinforce an existing roof. Insulation, when necessary, is mechanically attached to the deck, with the membrane affixed at set intervals using linear attached batten strips to protect against wind uplift. PVC, Fully Adhered – This system is especially recommended for applications over an existing substrate where the use of mechanical fasteners is undesirable, or unfeasible. The insulation is installed using hot asphalt, with the membrane fully adhered to the secure insulation. The system may also be installed over insulation that is attached using conventional fastening methods where applicable. It’s also ideal for special configurations such as domes and barrels. APP Modified Bitumen – This membrane is comprised of high quality asphalt that has been specially compounded with Atactic Polypropylene polymer to enhance tensile strength and resistance to foot traffic. Available in a smooth or granular surface, in an assortment of colors, this system is installed easily and efficiently with a propane torch or cold adhesives and a trowel. SBS Modified Bitumen – This membrane is formulated with high quality asphalt that has been specially modified with Styrene-Butadiene-Styrene polymer to improve elongation, low temperature flexibility and fatigue residence. This system is available in either smooth or granular surface in an assortment of colors. This system is installed easily and efficiently with a hot asphalt, propane torch or cold adhesives and a trowel. Standing seam, R-panel or corrugated metal panels are mechanically attached to the existing structural purlins. These systems are generally installed in place of an existing metal roof system.